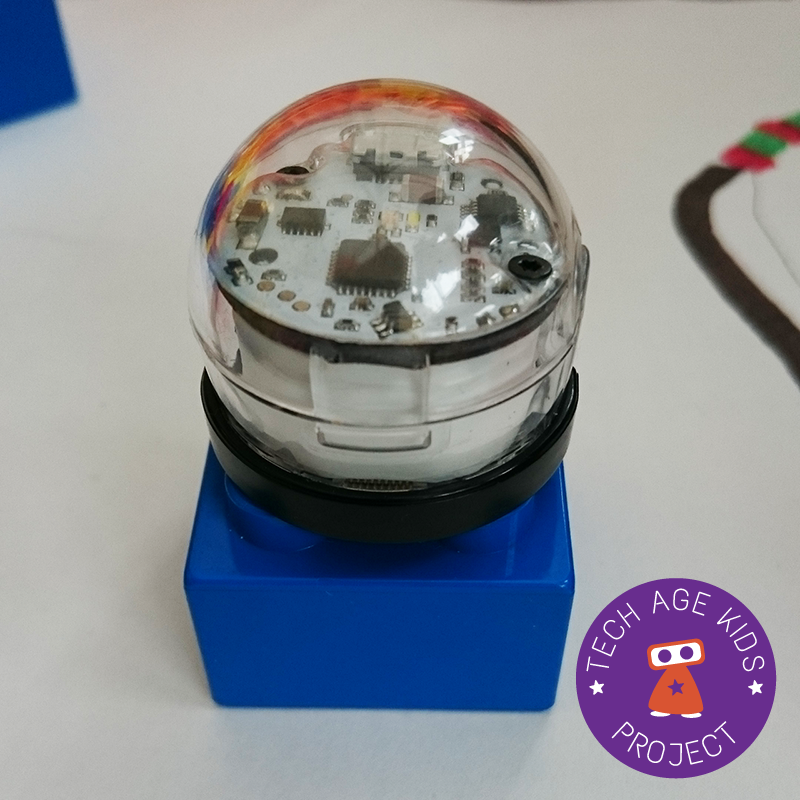 Ozobot are tiny line following robots that can be coded to perform certain tasks using colour codes. 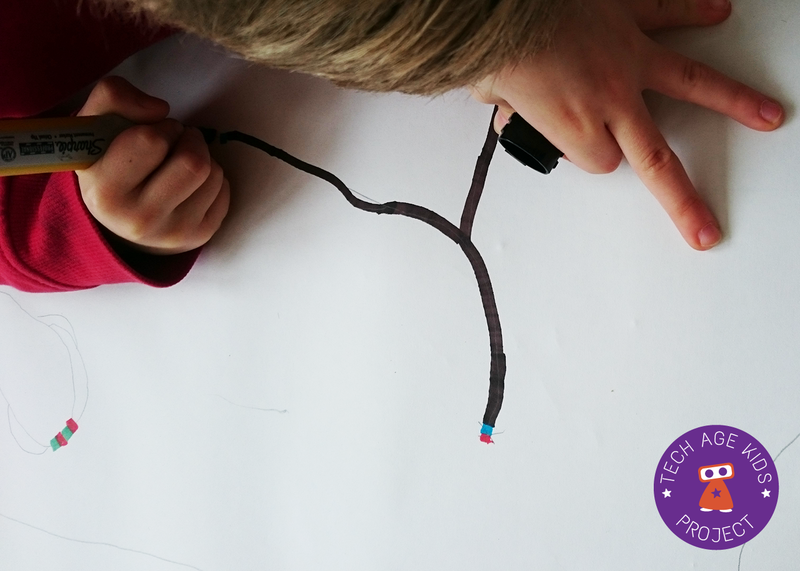 You can also programme Ozobots using the Blockly platform allowing you to code more complex instructions. 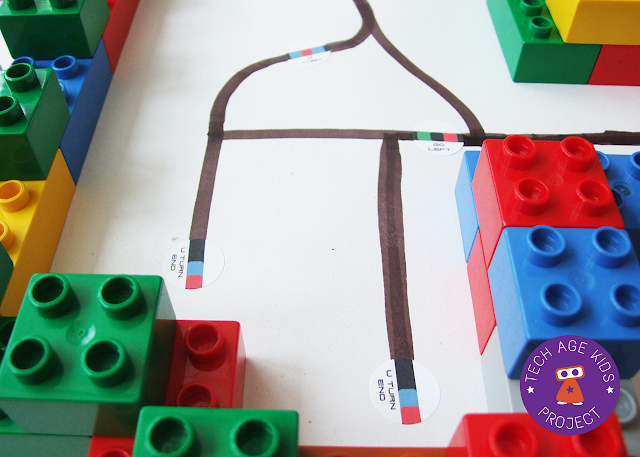 We really like Ozobots as they offer both online and offline play. 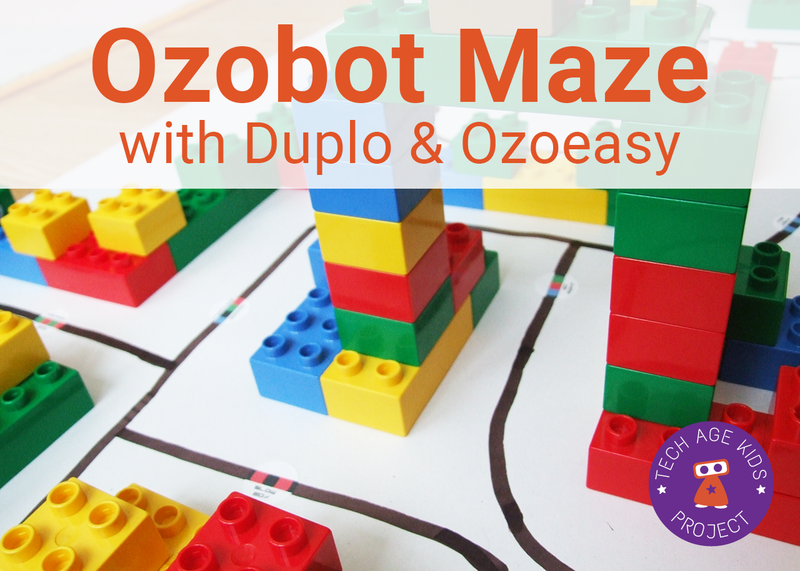 Some time ago we made a maze for Ozobot using LEGO Duplo and Ozoeasy Overwrite Codes. We've worked on our design process and share our experience below. 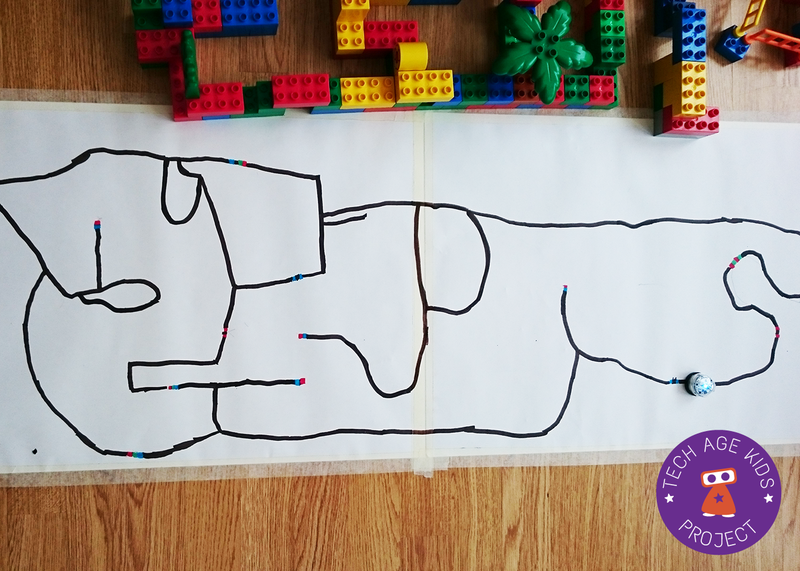 We've made our LEGO Maze for Ozobot twice, having learnt lots from the first experience, we were able to make design adjustments on the second attempt. It's important for kids to learn their first attempt, may not work. It's quite the skill and my kids are definitely still learning how to cope with failure. The kids really enjoyed building the Maze using LEGO Duplo, but you could use any type of building blocks, including MegaBlocks or even Wooden Blocks. Our first maze just navigated Ozobot from one end to the other. We noticed Ozobot was about the size of a 2 x 2 Duplo block. 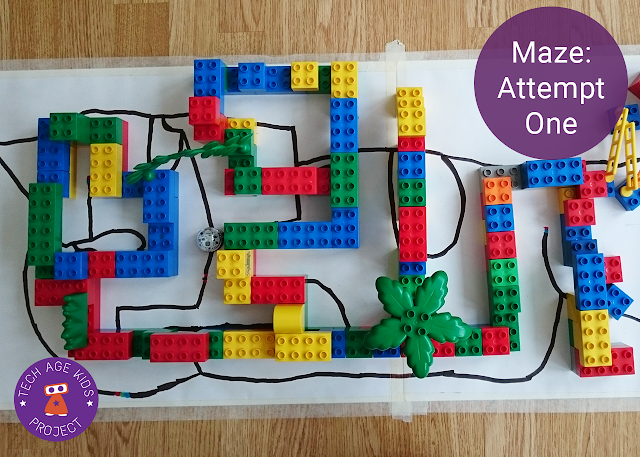 They built the maze one block wide, thinking if Ozobot was slightly smaller, it should move easily. It did work on the straights, but Ozobot didn't have enough room to turn. They had to rethink their design. On the second attempt, we made the track 2 x 4 Duplo block wide. This gave the Ozobots plenty of room to turn and also do other tricks like zigzag and tornado. As Ozobot is a line following robot, it needs a good solid black line to follow. We found a chisel edged black sharpie pen works the best. Our first maze, with its narrow path made drawing a good solid line really tricky. We came up with an idea to trace the line in pencil, shift the Duplo maze off the paper and then draw the line. This worked fairly well, except we had to rebuild some parts of the maze - they didn't quite make the move. 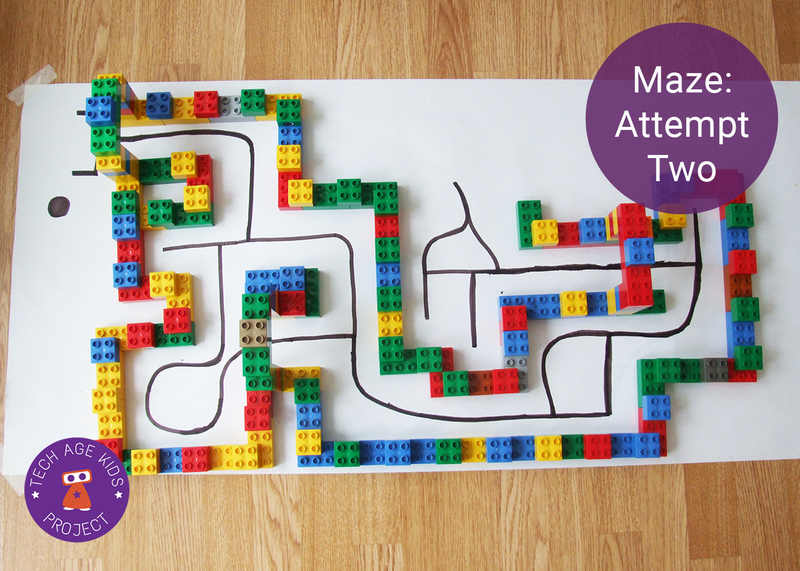 Our second maze, with its wider paths worked much better and this time we didn't move the Duplo structure. When you use Ozobots offline on paper, they can follow instructions using colour coded codes. The main colours are red, green, blue and black - and set in a particular order will give Ozobot commands, like turn left or turn around. Once you've drawn your solid black line, it's tricky to add your Ozocodes, unless you have predetermined their position and left a gap in the path line. We've come up with several ideas to solve the problem. One, use blue, green and red stickers cut into tiny squares and build up your codes over the path line. Two, use a white sticker and colour in your codes however you need to be careful to use the right shade of blue and green. Three, we discovered OzoEasy stickers! Ozoeasy Stickers are little round stickers with printed Ozocodes which are easy to use and the colours of the codes work first time. Eight year old inventor of Ozoeasy overwrite codes, sent us a pack to try out. Firstly we love the fact kids are solving problems, and coming up with brilliant products to help others too. I used the Ozoeasy overwrite code stickers with my 5 and 7 year old kids. They loved using them, as they were easy to peel off and stick in position. The Ozoeasy sticker made the coding part of our activity much more engaging. This time we didn't have to worry whether we'd left a gap in the line for our codes, we just decided which codes we wanted to use and stuck them over the line. We'd love it if the sticker were reusable, as sometimes we stuck it in the wrong direction or the wrong place. However we managed by carefully peeling it off and re-sticking with a bit of glue. The Ozoeasy starter pack comes with a sheet of direction codes, another with timer and moves codes and a black sheet for you to colour your own codes. This is really useful if you are making up new codes for your Ozobots using the Blockly app. The maze was part of a game the kids designed to get the aliens to a space rocket. We made alien costumes for the Ozobots and a space rocket which was placed at the end of the maze. The kids used a timer to see who's Alien Ozobot reached the rocket first. Ozobot randomly selects its path when it reaches a crossroad. In some cases we added Ozoeasy codes to send it in a specific direction. However the random choice, made the game really fun, as no route was the same and you were really lucky if your alien Ozobot choose the fastest route to the rocket.